One of my first walks in and around Bangor was to the Aber falls, located just a 15 minute drive outside of Bangor near the village of Abergwyngregyn. (Believe me, after a year of living in Wales I still have no idea how to pronounce place names). The falls is located at the end of a short 20 minute walk from the car park. 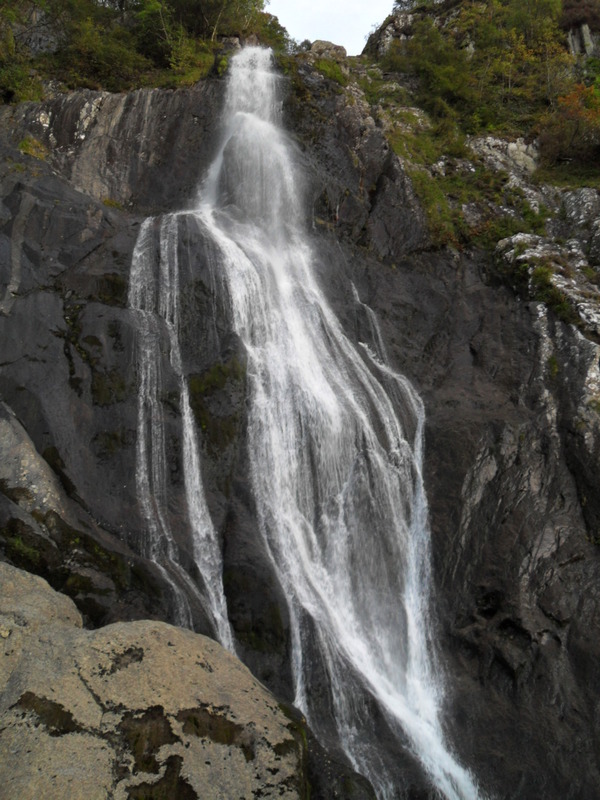 The waterfall is beautifully situated at the end of valley, boasting numerous bronze age sites, and surrounding it on all sides are the mountains that mark the beginning of the great Carneddau Range. Since coming to this valley it had been my intention to reach these summits via a horseshoe route that took in numerous summits including Drum, Foel Fras, Carnedd Gwenllian and Llwytmor. My first attempt failed miserably as I wound up on the wrong route and ended the day running away from an oncoming rain storm. However on my second attempt I finally found my way…… sort of. I began at the Aber Falls car park, crossing a stone bridge and following the lane straight ahead for a distance until I came across a second car park. From this car park I crossed over a gate and followed the well laid out path that stretched in front of me. 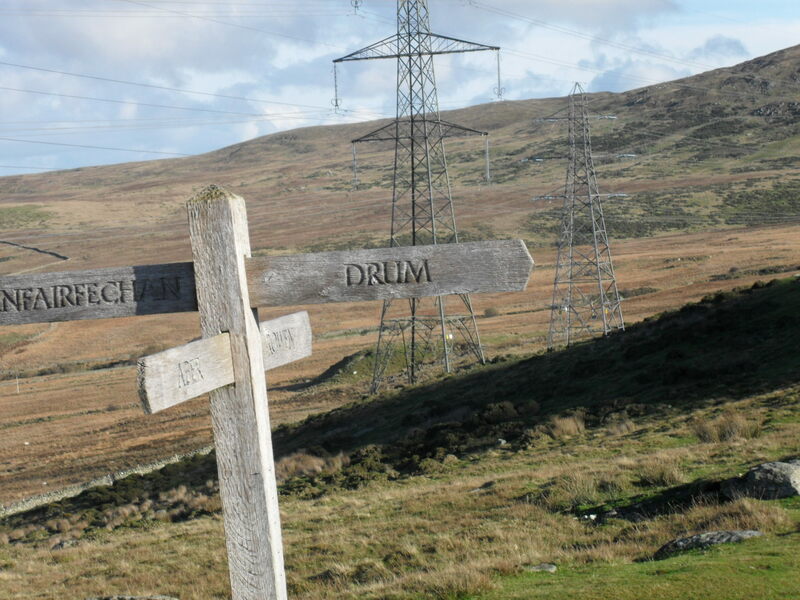 At this stage in the walk the going was easy, the path was well laid, there are even sign posts pointing to Drum. The route very much continued like this for an hour, crossing over some of North Wales most rugged landscapes, complete with superb views of Anglesey and Puffin Island.If only it wasn’t for the rather distracting electric pylons that seem to stalk the path and scarred my photos. Eventually the path began to wind upwards at a steady gradient, though it was still enough to make me breathless. As I neared Drum, I became rather worried as I found myself surrounded by a series of small summits that seemed to resemble some giant hump-back sea monster rising out of the grassy slopes. 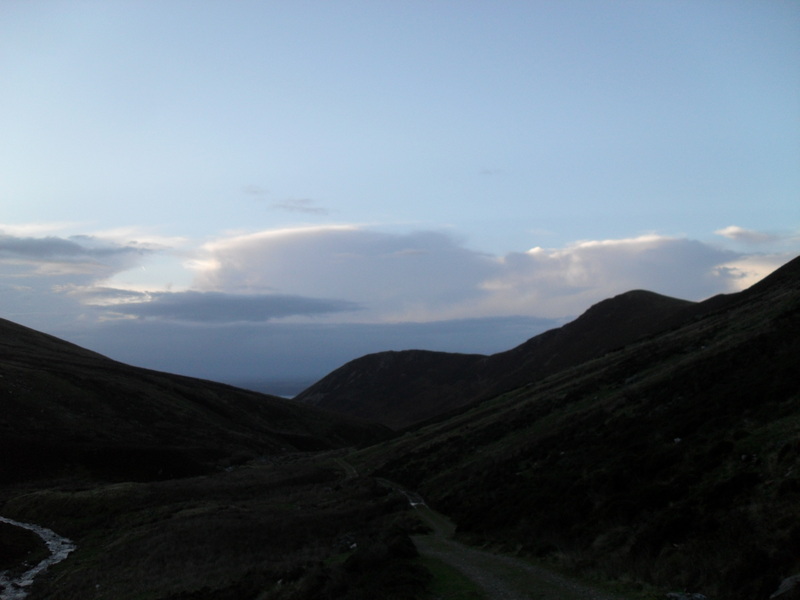 Anyone of these mountains could have been Drum and the signs that had usefully marked my route had now disappeared. Fortunately I worried needlessly as the path led directly to a wind shelter that marked the top of my first summit of the day, Drum. 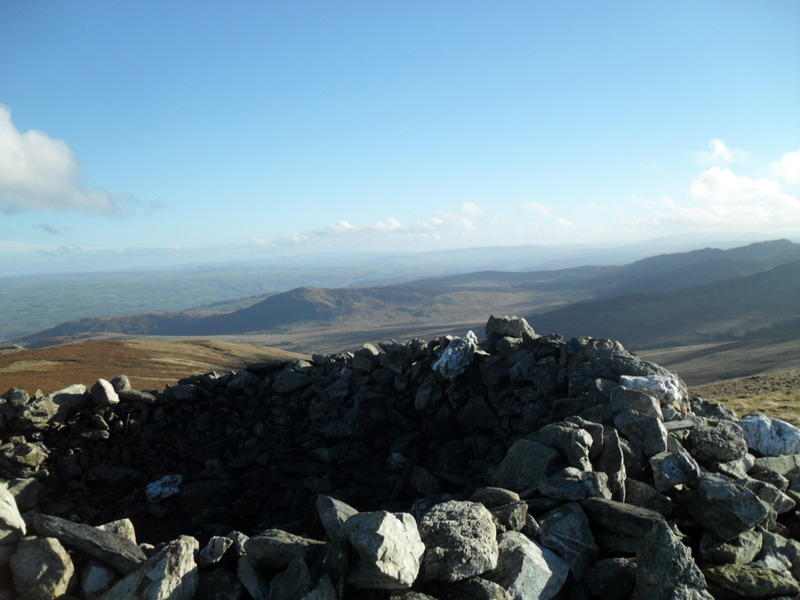 After lunch on Drum, I continued onward to the top of Foel Fras, which lay directly ahead of me. 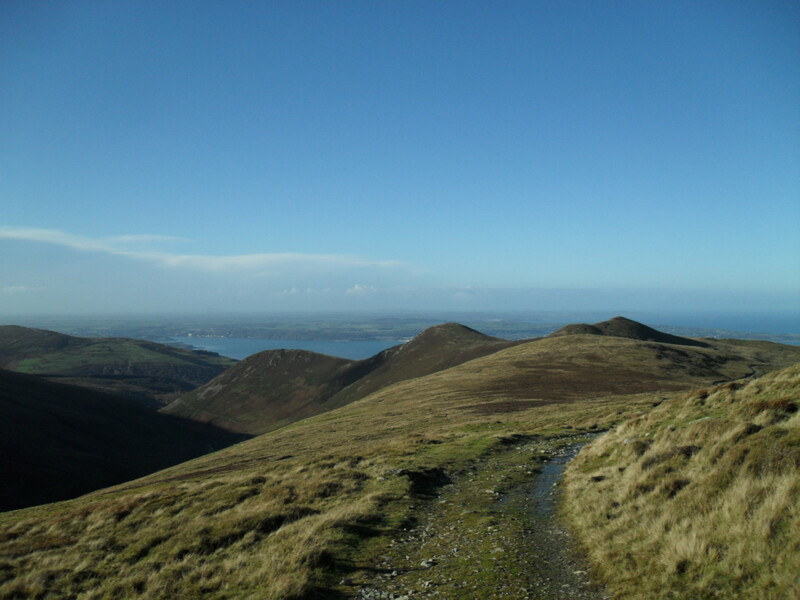 At this point the going became much harder as the path practically disappeared, transforming into a muddy moor, occasionally broken by stepping-stones and wooden platforms. In addition my route became much steeper and in truth I began to really struggle as I neared the top. 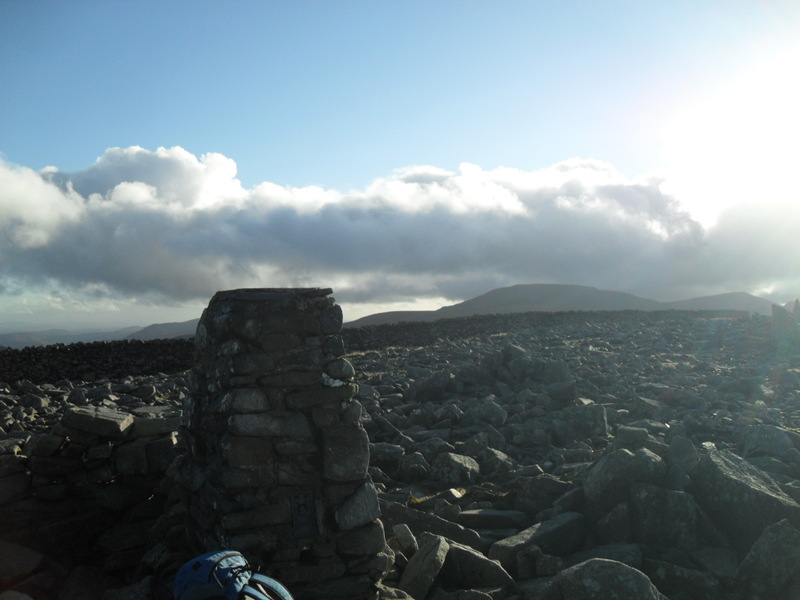 Finally I manged to stumble onto the rocky summit of Foel Fras, my first 3000 footer since I first moved to Bangor. Sadly though my view from the top was largely obscured by a large rain filled cloud heading directly towards me and on top of this I had forgotten it was November, and that on top of being generally cold the sun tended to set much sooner than usual. So with my fingers becoming numb from the cold, a growing lack of light and rain on the way I decided to abandon the rest of my walk and return the way I came. After all perhaps the best thing about mountain walking is understanding your limits and knowing when to turn back. I headed back to the col between Foel Fras and Drum, but I certainly didn’t fancy the long walk back around Drum, and instead decided to simply plow down the mountainside towards Llyn Anafon, which lay directly below me. The route was marshy, dotted with ankle catching holes and hidden streams; but I honestly felt that I had no choice but to follow this route if i wanted to avoid walking for hours in the dark. Reaching Llyn Anafon, a path led directly back to the second car park, passing under the numerous peaks that hours ago I had been walking on top of. In the sunset the mountains glowed a brilliant purple colour and every now and then I would pause just to drink in the silence that surrounded me, all day I hadn’t met a single other walker and my day was only disturbed by the gentle trickling of the Anafon. From the second car park it was an easy walk back to along the lane to the Aber Falls, after which I promptly dived into my car and whack on the heaters. I was disappointed that I was unable to complete the horseshoe route and from the way I struggled at the end demonstrated that I certainly needed to get fitter before attempting another 3000ft mountain.